My story as the co-founder of the OLIO, a free app that connects neighbors with each other and with local independent shops so surplus food can be shared, not thrown away, starts some years ago. Growing up as a farmer’s daughter, I experienced first-hand just how much hard work goes into growing food at the start of its long journey to the plate. That experience made it all the more shocking when I discovered that a third of all food produced globally goes to waste — an absolutely insane state of affairs. As a result, I’ve always done whatever I can to avoid food waste on a personal level. However it wasn’t until I was moving from Switzerland back to the U.K. last year that I had a ‘light bulb’ moment, and felt compelled to do more. On moving day I found myself with good food that I couldn’t bring myself to throw away. After failing to find anyone to give it to, I ended up having to smuggle it back into the country. This made me think there had to be a better way! After taking the idea to my co-founder Saasha Celestial-One — herself from a rural entrepreneurial background — we excitedly worked through our early thinking, and so OLIO was born! However, before launching headlong into product development, we first needed to do some more research. It quickly became very clear that the social, economic and environmental case for action against food waste was extremely compelling. Here in the UK alone, households — which are responsible for half of all food wasted in the country — throw away over £12 billion of edible food per year, at a cost of £700 to the average family. At the same time, food waste disposal costs local stores and governments £1 billion per year, whilst food waste also ranks as the third largest emitter of greenhouse gases, right behind the total emission from the USA and China. So, clearly a massive problem in desperate need of a solution. To test our idea, we created a WhatsApp group of 12 people we didn’t know — but who had responded to our market research survey to say they hated food waste — to see if they would take that next step to share their surplus food rather than throw it away. And thankfully the answer was a resounding yes! This trial gave us crucial insight into what product features we did, and just as importantly did not, need to build for our launch. And so we partnered with development agency, Simpleweb, to build the very first version of our OLIO free food waste app. 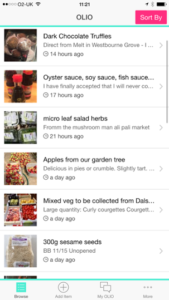 Users can share food nearing its use-by date from shops, cafes and markets; spare vegetables from the allotment; cakes from an amateur baker; or groceries from household fridges when they go away or move home. OLIO is really easy to use. Users simply snap a picture of their items and add them to OLIO. Neighbors then receive customized alerts and can request anything that takes their fancy, and arrange pick-up from the home/store, an OLIO Drop Box, or another agreed location. Since our July 2015 launch in North London, we have expanded across the rest of London, and then the UK, supported by an army of amazing grass roots volunteers, or ‘ambassadors’. They play a pivotal role in helping us establish OLIO in their local communities. We’re also delighted with the reception from the press and other important influencers, from MPs to Apple, who recently featured us among their ‘best new apps’. These early wins have helped OLIO raise seed funding from a brilliant backer whose investments include Facebook and Spotify. The Next Chapter of the OLIO Story: International Launch! We will continue to be laser-focused on building a convenient, fun and scaleable platform that others can take and use in their communities, thereby enabling us to fulfill our mission of “unlocking the value of food that is wasted in the home and local community”. And as we build on our momentum here in the UK, we plan to launch internationally in response to the requests we’ve had from all over the world! And if you’re interested in volunteering and joining us on our journey, then please email hello@olioex.com. Tessa is the Co-Founder of OLIO, a free app which harnesses the power of mobile technology and the sharing economy to provide a revolutionary new solution to the problem of food waste. Prior to founding OLIO, Tessa spent over 10 years as a digital Managing Director in media, financial services and at Dyson. Tessa has an MBA from Stanford and started her career as a strategy consultant. It seems to me that a lot of folks are wary of sharing food products because we’re so used to having the “prettiest”, fresh, and rather sterile products straight from the grocery store. I’m a big fan of “eating ugly” but I know it took me a while to get used to be okay with brown spots or near-to-expiration foods. How does OLIO work to overcome that tendency? Hi Jordan, our users are passionate about preventing food waste and/or they love a bargain, so thankfully 70-90% of all food put on the app is picked up, hurrah! So whilst browned bananas might not be appealing to lots of people, there is invariably an OLIOer who recognises that they are absolutely perfect for making banana bread! I think education is the key, and we see a lot of that, and role modelling, taking place via the app in terms of how users describe how their items could be eaten/prepared. I agree with Jordan! OLIO is a great invention with a great design and I definitely see the use of it. What is OLIO doing to help combat the eating tendencies of society? I also think that particularly in the Southeast however, farmers markets are on the rise eliminating food waste. Has OLIO ever thought about expanding into other aspects of food recovery like working with farmers markets? We’ve started to work with a couple of street food markets to rescue unsold food from them at the end of the day and re-distribute it via the app. We do this with the help of our volunteers – “Food Waste Heroes” we call them. Anyone who is interested in volunteering to collect surplus from their local farmers’ market, or bakery/cafe/shop, should drop us a line on volunteer@olioex.com and we will follow up with next steps. It’s super rewarding, fun and social! Great application! It immediately made me think of an initiative in Copenhagen. A small restaurant that cooks only with donated food and ingredients they find through dumpster diving. OLIO could help them even more to find inspiration for their dishes. I love how the application makes it so much easier to share leftover food for each of us. Additionally, I imagine that this could also work for other items like cosmetics. Why not pass on the cream that you don’t use anyway? Have you ever thought about that? Thank you for your lovely comment! We recently launched a ‘non-food’ section of the app for exactly the reason you suggest – OLIOers hate waste of all types, and all those unwanted toiletries, cleaning products, kitchen equipment etc could be better off used by a neighbour than sat gathering dust in your own home!Please do check it out. There’s a tab at the top right hand side of the browse screen of the app and you can select between food, non-food and all items. Thanks! Congrats on this great app! I’m so glad to hear it’s been getting the recognition and funding it deserves. Do you have any data yet on how far uses will typically travel to pickup an OLIO item? I’m just thinking about American suburbs or the countryside where people can be really widespread, and if they too would find use of this app. Or is OLIO more of an app for those in urban settings? I would say that OLIO is better suited to more urban settings that completely rural ones. However, OLIO works well in small villages too. We’ve discovered that people are prepared to travel surprisingly far for food (e.g. 30 min walk/bike/bus) – although these are the ‘early adopters’ who are super passionate about food waste/getting free food. The more mainstream consumer won’t be prepared to travel nearly as far and so our vision is that everybody should be able to source surplus food within a 10 minute walk of them. In the key cities where OLIO is really up and running this has been achieved, with many shares happening on the same street/around the corner. In practice we also find that the distance people are prepared to travel depends on the ‘desirability’ of the item on offer e.g. 3 loaves of Sourdough bread from the local bakery will attract people who are prepared to travel further to get it, rather than a small tin of sweetcorn! Hope that makes sense. So excited about this! I absolutely hate throwing away food, so when I’ve moved in the past I’ve sometimes forced my friends to take food that they don’t really want. I just downloaded the app and it doesn’t look like it has too much traction in NYC yet, but hopefully we’ll get that started! Hi Grace! If you’re interested, how OLIO gets going in new areas (such as San Francisco, Boston and Cedar Rapids where we’ve already seen food sharing happening!) is via our network of volunteers who are spreading the word about OLIO in their neighbourhoods. If you’re interested in finding out more – and it can take as little or as much time as you’d like – then please drop us a line on hello@olioex.com or check out the volunteers section of our web site. Thanks! Yes! Let’s get this going in NYC. I downloaded OLIO in April 2016 and emailed them asking how I could help them bring the app to NYC. They were so receptive and added me to their list of Ambassadors 🙂 Download the app or ask me any questions if you’re in NYC too! 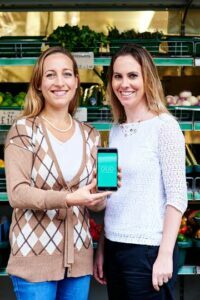 This app is so innovative and prevents food waste! Combining technology with environmental/ waste concerns will really help society in this generation. Wow, so simple and clever. Reminds me of Freecylce, but a focus on food! Would be great to get restaurants and supermarkets on board too, so that Food pantries could quickly find suppliers. Reaching out to help get set up in NYC! Technology has had such a profound impact on our society. imagine when dating apps first emerged, they were so taboo, but now they are readily used. There is certainly a need for this type of application, but how do we increase our comfort with sharing? What a great app! I love hearing about initiatives to reduce food waste because the amount of food wasted yearly is ridiculous, especially considering the many who are without food to eat (not to mention what happens when this wasted food goes to the landfill). There is an indisputable need for this type of app everywhere. I can’t wait to see it implemented in NYC. This is a great app, and I will be downloading it asap! Reading this discussion on food waste has led me to think about the food waste problems that face my college. Unable to accurately estimate how much students will consume at each meal, large quantities are inevitably discarded at the end of the day. Has OLIO considered attempting to expand and include large institutions such as universities? The greater size of the leftovers may be problematic, but if schools could somehow become involved (maybe by including organizations with a large demand like soup kitchens) the implications for reducing food waste could be incredible. We have a volunteer programme called our “Food Waste Heroes” programme and this involves our volunteers picking up unsold food from bakeries, supermarkets, street food markets etc at the end of the day, taking it home and re-distributing it to the local community via the app. We’re about to pilot it in a workplace canteen/cafe too, so I don’t see any reason why it couldn’t work on a Uni campus! If you want to find out more please check out http://www.olioex.com and read the Get Involved/Volunteer section. Thanks!! This is great! I think that a lot of people underestimate the amount of food waste they actually produce (including me!). This is a wonderful way to track that and help concerned people use it sustainably. Hi Tessa! This is an awesome idea you can be very proud. Being in Paris France, I wish something like that existed ! This would make life so much easier for many people I know travelling a lot and also helping them get involved in this reusing system. I can’t wait for you to launch it here. Hi there Audrey, the english language version of OLIO is already available in France. If you’re interested in finding out how you can help kickstart OLIO in your neighbourhood then please do check out the volunteer section of our website on http://www.oliex.com or email hello@olioex.com. Thanks! Are there any plans for a windows app? Wow! I am astonished by the ingenuity of this app. I think one of the brilliant things about this app is that it makes food waste a community issue. By making it a community issue, more people will be willing to get involved and take action. Food is so central to everyone’s life and culture, and I think that this app brings that idea to the forefront. People can not only get to know each other a little better through interacting but also by learning about different people’s cultures based on the foods that they cook. OLIO is the epitome of choosing to tackle a major societal issue as opposed to merely acknowledging it without a plan of action. At Columbia University, we have a similar app called Share Meals; however, it is not widely used. What students do instead is post available food or request dining hall meal swipes from other students on a Facebook page entitled CU Meal Share. From my experience, it seems that CU Meal Share is more popular since Facebook is a platform with which students already engage and merely posting a quick sentence about the food in question is more simple than using even an app that is very straightforward. With clubs and organizations constantly bringing in catered food for events, there is inevitably a surplus that could easily go to waste if the target audience is not informed. OLIO, CU Meal Share, and even Share Meals all unite in an online space those looking to give and those in need, perfectly blending technology and human need and truly addressing such a pervasive societal issue. This app is a brilliant use of crowd-sourcing that’s become so common in our daily loves. I can’t wait to see how this app could impact communities that live in food deserts without easy access to fresh produce or groceries. It would be interesting to see if this application could be expanded so that otherwise wasted food could be brought into other communities, not just the ones that they were initially from. This app is a brilliant use of crowd-sourcing that’s become so common in our daily lives. I can’t wait to see how this app could impact communities that live in food deserts without easy access to fresh produce or groceries. It would be interesting to see if this application could be expanded so that otherwise wasted food could be brought into other communities, not just the ones that they were initially from. What a great app! Have you launched it internationally yet? I sure hope you do. I feel like this would be well received in so many communities. I love how you are using an app and tech to make the world a better place and more connected. Tech usually disconnects us from each other but your app helps to connect neighbors and communities over food sharing and that is wonderful. I applaud you for your work and I hope you keep it up! I think David Maluf brings up a great point that I would like to expand on: how do you plan on using the app to help poor and marginalized communities? Sharing food is a privilege and its important to use it to help those communities that are underprivileged. So how do you connect privileged communities that have food to share with those that underprivileged and live far away? This would be a interesting to see how it would do at a university. I have witnessed countless times college students throwing away their lunch that looked like it wasn’t even touched, and I also remember hearing many student stories on how they would go hungry because they could not afford cafeteria food and lacked access to good healthy food otherwise, so their only means was to eat frozen box food. This was heartbreaking and though it’s the responsibility of the school to ensure that all their students are fed, I think this app will shine a bigger light to food waste in our schools.